I fully admit that I'm not technical. I don't do math or measurements and I don't build because I'm insanely klutzy and could severely harm myself. But I threw caution to the wind and jumped in on the build of THE BULLET ROUND. Here are some pictures. I'm not in any of them because I was taking the pictures of course, but trust me I was working. My body hates me and I feel like I am 105 and arthritic. Can I get a spa day please! 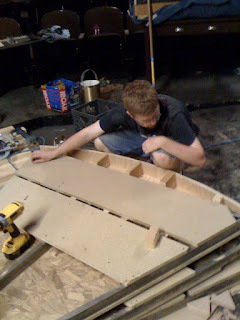 Chad, our Technical Director inspects his work. 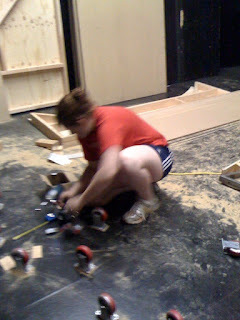 Kim, our SM screws in the casters. 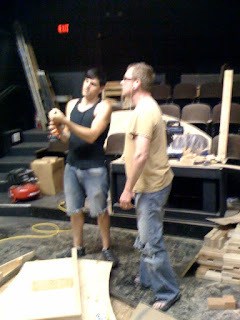 Here, Paul shows Gary how to use a drill. 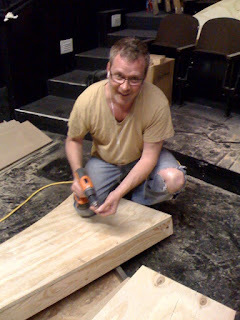 Paul's a fantastic actor who can also build things. What more can a girl ask for? Adorable. Gary gives it a try! Where we ended late last night. I'll keep you posted on the rest of the process. We have tech all day Saturday and all day Sunday. I'm actually looking forward to it. I love it when it all comes together. Looks great Megan! You are a rock star. 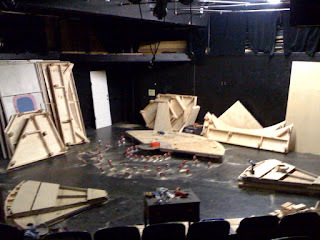 I am glad you didn't get harmed in the process of building the set. A great feat indeed! Keep it up, Megan! Can't wait to see the final product!